In January 1972, the quarter-final draw was held for the last eight stage of the European Championship. England, who had come through their qualification group as unbeaten winners ahead of Switzerland, Greece and Malta, were to draw one of the toughest-looking opponents as they were paired with West Germany. Immediately there were concerns both in terms of England’s chances and practicalities. 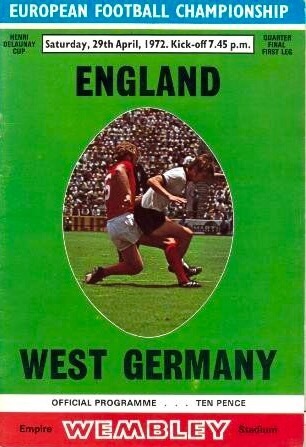 Firstly, West Germany were a good side who had beaten England at the 1970 World Cup. Secondly, the second-leg would be away which was seen as handing the advantage to the West Germans. Thirdly, the first-leg was scheduled to be played on April 29 – the last Saturday of the Football League season; and lastly, the home leg would clash with when Wembley was booked for non-league football’s showpiece occasion of the FA Trophy final. With professional football out of the question on a Sunday at the time in England, there were now headaches facing the Football Association which quickly needed resolving. Eventually the Trophy final was played two weeks earlier than scheduled and several First Division matches on April 29 were postponed to accommodate England call-ups. As was quite often the case at the time, the First Division title race would have to be resolved during midweek rearranged matches. But for England manager Sir Alf Ramsey there was going to be no easy method to defeat the West Germans, although he sounded cheerful enough. “It is a great draw from all aspects,” he said. “They are one of the finest teams in the world and the memories of our previous games will surely add to the occasion.” It was certainly hard to ignore the recent past contests at the World Cups of 1966 and 1970. Despite the significance of the West Germany matches, England went into them having not played for almost five months. Their absentees for the first-leg would include defender Roy McFarland who was withdrawn due to injury, although he would feature for Derby County in their vital title battle against Liverpool 48 hours later (prompting Ramsey to speak out against Derby manager Brian Clough). Ramsey instead paired Moore with Norman Hunter, a central defensive partnership that would not prove successful. Five players remained in the England side from the 1966 final, but for Geoff Hurst this would be the final act. He was substituted and never selected again, finishing his England career against the side he made his debut against and enjoyed his most glorious match against in separate fixtures in 1966. The end was also drawing near for goalkeeper Gordon Banks, whose career would be curtailed by a car crash later in the year. For the remaining boys of ’66 – Moore, Alan Ball and Martin Peters, plus manager Ramsey – there would remain an England future but past glories would never be rekindled. 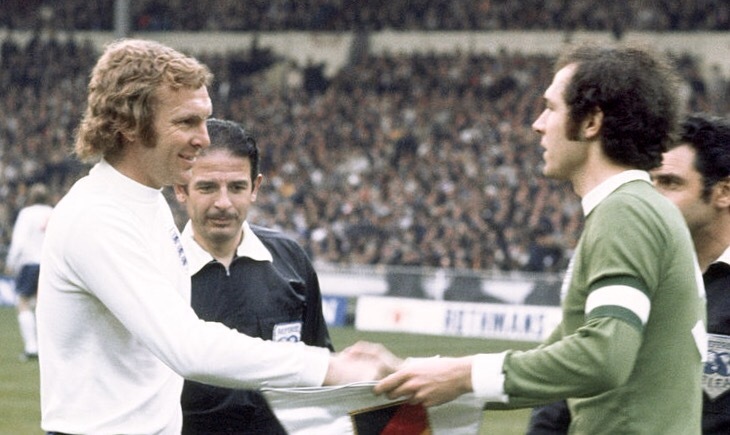 Bobby Moore and Franz Beckenbauer shake hands prior to kick-off at Wembley. 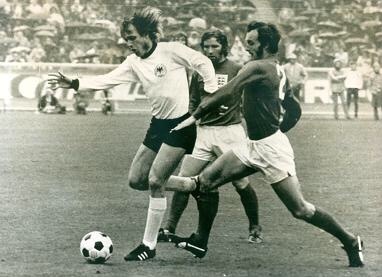 One man who would leave his mark on the match would be midfielder Günter Netzer. The West German was 27 but not been part of the World Cup squad in 1966 and 1970. This was to be his night, thanks to his darting runs and pinpoint passes as England paid for not deploying a natural holding midfielder to deal with him. Also impressing was 20-year-old Uli Hoeness, who put the West Germans ahead in the first half. If Moore’s England career is best defined by captaining the team to glory in 1966 and his unforgettable tackle against Brazil in 1970, then at the other end of the scale was his error that led to a vital goal being conceded against West Germany in 1972. He tried to dribble the ball out of the area, was caught in possession and Hoeness was able to score past Banks. 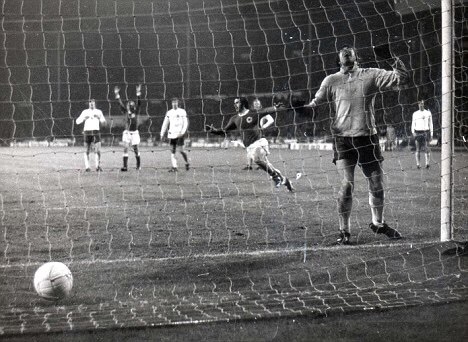 England were second best on the night and could have gone further behind, but with 15 minutes left they drew level as Francis Lee scored past Sepp Maier from close range. Now the momentum should have been with them to go and get a result. But West Germany were to regain the advantage six minutes from time. Moore struggled to keep pace with Siggi Held – one of the West German survivors from 1966 – and brought him down for a penalty, although replays would later suggest contact initially took place outside the box. Netzer scored the goal his performance deserved, despite Banks getting a hand to the penalty. Despair for Gordon Banks as he concedes against West Germany at Wembley. Think English footballers from the 1970s and two types spring to mind. One of them is the mavericks, a group of free-spirited, flair players that Ramsey seldom picked; and the other is the hard men who would happily chop down their opponents. Ramsey would make use of the latter in Berlin, bringing Hunter into midfield along with Peter Storey, who had a reputation as a ‘hatchet man’. Ramsey was clearly looking to avoid a repeat of the first leg by giving England defensive bite in midfield. But it was a move that offered England little attacking threat and did nothing to alter the perception among the critics that Ramsey was a defensively-minded manager. He did show some acknowledgement of the mavericks by picking Rodney Marsh in attack, but he was taken off before the hour mark and won just nine caps in total. England attempt to gain possession in Berlin. In some respects the tactical plan worked well in the Berlin rain, as England were not embarrassed like they had been at Wembley and earned a 0-0 draw. Had England gone there needing a draw to progress, Ramsey might have earned plaudits for finding a system to stop the Germans. But instead his detractors felt the approach smacked of damage limitation, England offering little attacking zest to overturn the aggregate deficit. 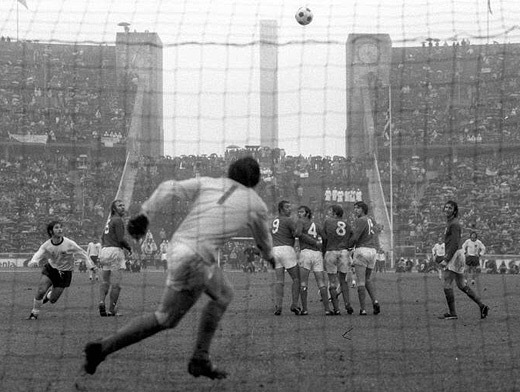 Gordon Banks faces a free-kick in Berlin. However, Taylor’s colleague Ken Jones offered some support for Ramsey over his tactics in Berlin: “Had he thrown his team at the Germans, then the Germans would merely have emphasised the skill superiority they displayed at Wembley. There would have been no sympathy for a gamble that failed.” Jones also voiced his fear that “England could be discredited totally as a power in world football” if steps were not taken to reduce the amount of fixtures English clubs played. For England, there would be no place in the finals tournament, which Belgium would now host. West Germany went on to beat the hosts and USSR to win the tournament, following it up by lifting the World Cup on home soil. England wouldn’t even qualify for that, as Ramsey’s England reign ended ignominiously. With hindsight at least Ramsey probably should have stepped down after the Euro ’72 exit, with England clearly no longer dining at international football’s top table but with him having led England to at least the last eight in four successive competitions. The West Germany defeat showed England now lagged behind the world’s best and set the trend for the years that followed, with things about to get even worse.